Employ our exquisite activity-based worksheets to assist young learners gain a thorough understanding on the concept of place values. This page features a wide range of engaging tasks like color the caterpillar, cut-and glue activities involving blocks, jigsaw puzzles, railroad cars, place value strips and much more! 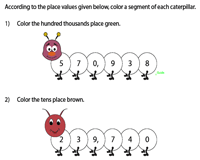 Get young ones to color the segments on the fuzzy wuzzy caterpillars in accordance with the place values given! 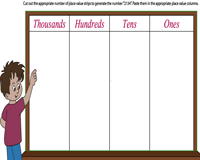 This activity helps kids recognize place values of numbers and hones their fine motor skills as well. Observe the numbers given in the worksheets. Cut out the appropriate number of blocks from the cut-page and glue them onto the worksheets. This forms a strong visual aid in understanding place values! Read the numbers shown in the boxes. 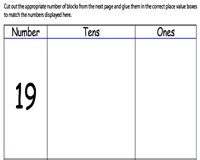 Cut out the puzzle pieces displayed as blocks, number names, numbers in the place value form and word form that match the given numbers. Glue them in the correct boxes. Observe the numbers displayed on the engines. 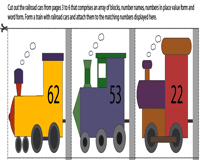 Cut out the railroad cars that comprise blocks, number names, numbers in the place value form and word form and match them with the engine numbers. Glue them together to form a train with four railroad cars. Read the numbers displayed on each worksheet. Cut-and-glue the appropriate number of place value strips in the columns to match the given numbers. Use the template to create your own activity. 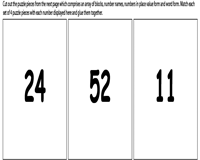 Observe the 4-digit number shown on the worksheets. Cut out the apt number of place value strips. Glue them onto the worksheets to match the numbers provided. 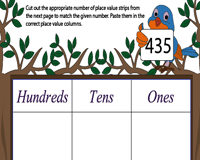 Children may hone their fine motor skills with this place value activity.